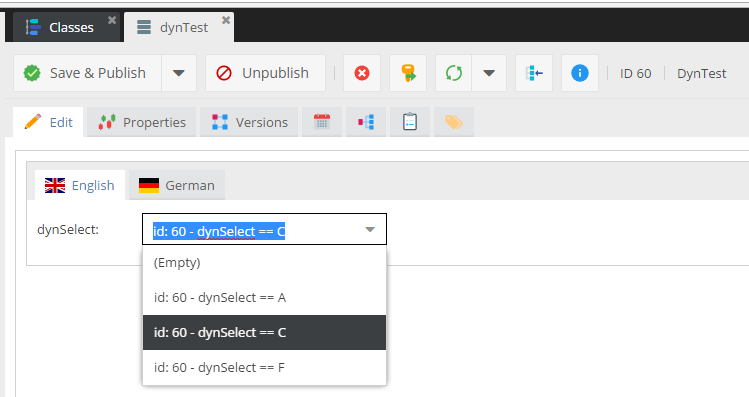 For the select & multiselect datatype you can specify a dynamic options provider class. This allows you to generate a list of valid options on-the-fly instead of using a static list. The select datatype also allows you to define the default option at runtime. You can also add some additional static data which will be passed to the data provider. Note that there are two ways to define an options provider. Depending on your datatype you have to implement the appropriate interface. hasStaticOptions should return whether your options are depending on the object context (i.e. different options for different objects) or not. This is especially important for the object grid. For object-context depending option there will be no batch assignment mode. Also, filtering can only be done through a text field instead of the options list. This will generate the following options.